It’s that time of year when everyone wants to eat and drink outside. Patios, poolside, rooftops and decks all make great alfresco venues. One thing that could ruin any alfresco experience however is broken glass. For operators that demand a certain level of elegance in their presentation, glass is no longer a necessity. With the introduction of Carlisle’s contemporary Cascata and Astaire lines, operators can get an elegant presentation without the risk of broken glass. Both Cascata Carafes and Astaire Drinkware are made of shatterproof, NSF rated polycarbonate plastic. Polycarbonate rates as one of the most durable plastics used to make foodservice supplies. It also has a very high level of clarity. Additionally, it’s dishwasher safe. 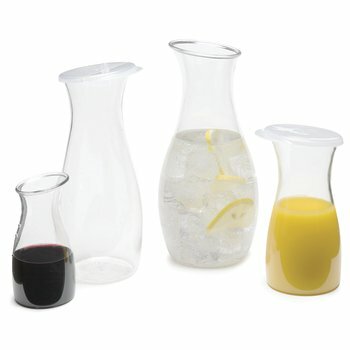 The stylish look of Cascata Carafes makes them perfect for tabletops or buffets. They come in four different sizes, all of which are ergonomically designed so they’re easy to hold and pour from. The larger sized carafes are perfect for water, juice, or wine while the smaller sizes can be used for single-portion drinks, salad dressing, syrup or even snack mix. For instances like room service, where drinks will travel a fair distance, Carlisle has made snap-on lids available in a solid or hinged style. Lastly, all Cascata Carafes feature capacity marks to aid in portion control. The Astaire line features eight pieces. The line’s sleek and contemporary look includes an assortment of wine glasses. It even includes a trendy stemless wine glass for occasions that require more stability. For more on the Astaire and Cascata lines from Carlisle, click here.